Spring is right around the corner and that means it's officially dress season! Although I am the first one to admit that my love for a good little black dress is sometimes a bit much, I am planning on benching them for the next couple of seasons. Instead, I am adding some colour to my wardrobe, including this beautiful crochet fit and flare dress in one of 2016's Pantone colours - serenity. The detailing on this dress is spectacular, from the could shoulder sleeve all the way to the intricate crochet design. 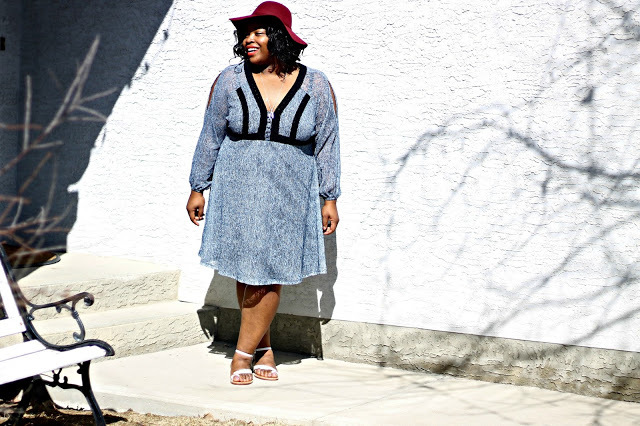 This dress could easily have been dressed up with a pair of scrappy heeled sandals and clutch, but I decided to style it down, creating the perfect spring weekend outfit. I paired this Love &amp; Legend dress with a pair of Coach flats that I picked up for a great deal at Winners. Along side a colourful floppy hat (a spring essential piece! ), this outfit is all about comfort while also saying true to your inner fashionista!